Altimeter Group’s mobile analyst Chris Silva, with support from Alan Webber and Jessica Groopman, launched his first report with the company today: “Make an App for That: Mobile Strategies for Retailers.” It covers the growing trend of using mobile devices to enhance the shopping experience and chronicles brands’ and retailers’ strategies to capture those shoppers. Visit the Altimeter Group site to download the report in full. At the end of 2011, nearly 50 percent of mobile consumers had a smartphone. The number of these users is quickly growing, and shopping is a top activity for smartphone owners, with 77 percent of smartphone owners using their device in a store. This report outlines strategies for each of the three maturity levels of mobile retail strategies, and highlights successful traits of successful mobile efforts from brands like Best Buy, Starbucks and Zappos. 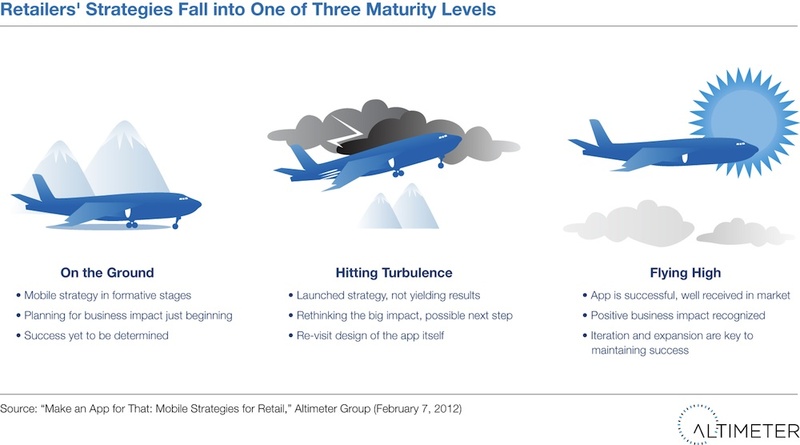 The report also contains a maturity scoring tool for retailers to assess their current level of maturity and take discrete steps to improve their mobile fortunes by tuning their mobile strategy. Chris is also hosting a Webinar on the report. You can sign up for that here. If you prefer to chat about the report on Twitter, use the hashtag #makeanappforthat to stay on top of the latest tweets. I’d love to know what you think of the report. What were your move valuable takeaways? What additional research on mobile would you like to see Altimeter Group tackle in the future? P.S. I’m also working on an upcoming Altimeter Group report on content marketing with our advertising and media analyst Rebecca Lieb that will be released in February — stay tuned for more information when we publish! The Future of Facebook Advertising: Context and … Influence?